WHEN human resources manager Kate Hammond was made redundant early this year, she worried about how she and her husband were going to settle their monthly bills including their mortgage repayments, as they had very little savings. So, Hammond dug deep into her wardrobe and managed to raise £1,000 (RM4,980) for her short-term cash flow needs, by taking her Â£800 Mulberry Bayswater handbag and a £2,000 Gucci bag to the pawnbrokers, she told the Daily Mail. Similarly, interior designer Jessica Humphreys pawned her £12,000 black Hermes tote, securing Â£4,000 to cover several big family bills including school fees and an emergency home repair bill. Both women are among an increasing number of affluent, middle-class families in the UK who have been turning to pawnbrokers for their cash flow needs since the recession, as tightened household budgets and tough lending conditions at high-street banks force them to seek unconventional funding alternatives. And it’s not just affluent families who are doing it; asset-rich but cash-poor small businesses are also opting for pawnbrokers to fund their short- to medium-term financial needs. Many are attracted by how quickly and discreetly they are able to secure loans from pawnbrokers, as long as they have an asset of value to use as collateral. These days, pawnbroking is no longer just the traditional “cash for gold” transaction, nor is it just gold, jewellery and Rolex watches that are accepted as collateral. Prestige Pawnbrokers, a high-end pawnbroker based in the affluent suburb of Weybridge in Surrey, describes itself on its website as “pawnbroker loans against: art, watches, gold, jewellery, antiques, cars, logbooks, wine, property & land, and collectables”. Its owner, James Constantinou, told the BBC recently that he accepts anything of value, including fine wines, and no doubt, designer apparel including shoes and handbags. Since the onset of the financial crisis, the pawnbroking business in the UK has been thriving, although The Independent reports that the industry has been growing steadily since the 1980s, when some of the main players transformed pawnbroking’s shady image by investing in modern, well-lit outlets in good locations. Trade body National Pawnbrokers Association (NPA) represents members in a £500 million loan market with 1,800 retail outlets growing at a rate of over 10% annually. Last year alone, the total market increased by 15%, with lending to middle-income customers and small businesses accounting for half that growth, its CEO Ray Perry says. Some of the established names in the industry are expanding rapidly; the AIM-listed Albemarle & Bond group, which had 215 trading outlets at December 2011, is on track to open 25 more stores this year, and a further 25 in 2013. 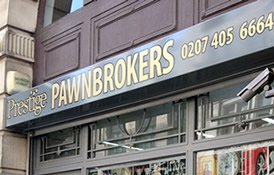 H & T Pawnbrokers, also listed on AIM with 160 shops nationwide, says it experienced record lending levels in 2011, driven by an increased average loan and additional new stores. The recession has also seen a proliferation of new players in the market, including the UK’s first online pawnbroker Borro.com, which began trading in mid-2008. Nikolas Michael, said to be the first pawnbroker to open in the Square Mile in a century when it set up shop on London’s Bishopsgate in 2009, has seen a “savvy” City clientele coming in with expensive Swiss watches and Tiffany jewellery for short-term loans to tide them over the bonus drought. While the greater availability of pawnbroking loans has no doubt been a boon for cash-strapped Britons, there are concerns about the impact of this proliferation of pawn shops and payday loan outlets on various communities. The Guardian reports that there are 11 shops offering payday and pawnbroking loans, as well as “jewellery for cash” on the high street in Walthamstow, North East London, an area known to have high levels of deprivation. Its local MP Stella Creasy contends that these firms, who often lend at a steep cost, are targeting poor areas of the country. Pawnbroking loans which reportedly charge interest rates of between 5% and 10% a month, or a starting annual percentage rate (APR) of 69% are considered a cheaper form of short-term borrowing than the average payday loan, which can charge an APR equivalent to more than 1,000%. Customers will however, need to repay the loan within a stipulated time period, usually six months, or risk losing their item. According to the NPA, 85% of loans from pawnbrokers are usually redeemed. For all its pros and cons, there is little doubt that the pawnbroking industry has benefited from the financial crisis and recession and continues to have growth potential, particularly as bank lending continues to remain tight. What also bodes well for the high-end segment of the industry is the fact that insecurity about unstable financial markets has seen investors increasingly turning to alternative investments as safe havens for their money. A recent study by Barclays bank shows that high-net worth individuals now hold 9.6% of their wealth in such assets, including what former economist Joe Roseman terms as “swag” silver, wine, art and gold. And while it remains debatable whether or not designer apparel can be considered a “safe haven” asset class, the fact that it is a store of value accepted by pawnbrokers is certainly an added incentive to buy that must-have designer handbag. Lim Yin Foong was editor of Personal Money, a Malaysian personal finance magazine published by The Edge Communications, from 2001 to 2006. She is currently based in the UK. This story appeared in The Edge Financial Daily on June 27, 2012.